The dolly grip is the camera operator’s partner. I like to think of us as a team. True, the operator has his unique responsibilities and the dolly grip has duties that are his alone. But when it comes to planning and executing the shot, we work together toward the same goal: to successfully translate a bit of storytelling into a visual medium. For a camera operator, there is no more important collaborator on the set than the dolly grip. As the director and the director of photography discuss the shot, a good dolly grip is already thinking about what kind of track to use. It is always helpful to be able to look through the director’s viewfinder to set the start mark and end mark so everyone agrees on the shot. Once the director and director of photography turn their concentration to other matters, the camera operator and I start our discussion. Shall we build a plywood dance floor or use rail or maybe we’ll just roll on the floor? It’s so important for a camera operator to share information with his dolly grip to allow the dolly grip to make informed choices in the planning stages. Among other things we need to discuss the focal length of the lens, the speed of the move, and whether or not the actors will have to cross the dolly track. Armed with this information about the shot, I can offer some suggestions about how this could be achieved from a dolly grip point of view. An exchange of ideas on set is often helpful and productive – providing time allows of course. I can, for example, recommend orienting the dolly in a certain direction, may suggest using an offset or a slider to reposition the camera slightly or perhaps we need a camera riser to achieve the desired effect. As an experienced dolly grip I always have some variety of solutions up my sleeve – don’t struggle in silence, talk to me, we’re a team! As in all cases of good teamwork, good communication and a good measure of trust goes a long way to producing creative, excellent work. If I know that the camera operator trusts me, trusts my judgment and my taste that gives me the freedom and the confidence to make adjustments to the shot on the fly. No matter how much you plan in advance, something always changes and a lot of the decisions that affect the success of a shot will occur while you’re rolling. An actor will miss the mark or the scene will take an unexpected turn and both the camera operator and the dolly grip have to be ready to adapt to what is happening in front of them. If the dolly grip is hesitant or feels that he doesn’t have the endorsement of the camera operator and the director of photography he won’t take those chances that are necessary to make the shot work on the spur of the moment. 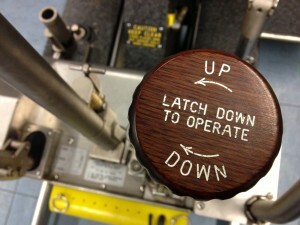 Sometimes dolly grips use on-board monitors to help them see exactly what the operator sees. If there is a problem, if an actor is being blocked or the shot isn’t moving along the way it should, they can make an adjustment and see the results of the change right away. But a good dolly grip knows what’s happening in the frame even without looking at the monitor. 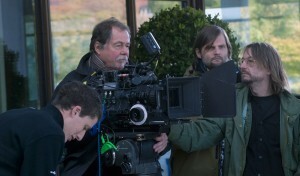 He understands the shot, he knows the focal length, he sees what the operator is doing and where the actors are and even without the monitor, he is able to see the frame and make those little accommodations in the movement of the dolly that make the difference between a spoiled take and a successful shot. On dolly shots or crane shots using remote heads, it´s good to use wireless intercoms so the dolly grip and the camera operator can talk throughout the shot and make those little changes on the fly. Those kinds of shots are really fun because by actually consulting each other during the shot, it becomes a true collaboration. The camera operator is panning and tilting, the dolly grip is swinging the crane around, extending and retracting and the whole time we’re communicating and improvising, reacting to what’s happening in front of the lens. It’s a very flexible, fluid way of working that often ends in unexpected and exciting results. In addition to planning and executing the shot, dolly grips have other responsibilities that are outside the realm of actual dolly movement. But these are just as important to the success of their work. Safety, particularly the camera operator’s safety, is one of the dolly grip’s most important jobs. It is the dolly grip’s responsibility to guide the operator through a hand held shot when he can’t see where he is going. If camera operators shoot hand-held while backing up through the set, trying to stay in front of fast moving actors, they can put total trust in their dolly grip. It´s my responsibility to safely pull you past the obstacles, cueing you with a light but firm touch. I tell you when to turn or step up or down and deliver you to the end mark in the same way I would as if pulling the dolly. 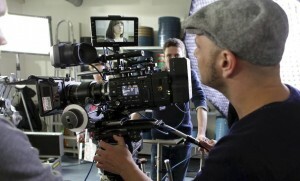 A good, experienced dolly grip can make the camera operator’s job so much easier and more gratifying. The dolly grip can be a wonderful collaborator and partner.